I rvTiilcrv nudution cyeJe minus two earhon atoms! If the long chain fatty acid being metabolized has an even number of carbon atoms, then the acyl CoA produced during Una! cycle through |i-lipid oxidation is acetyl CoA, which enters the TCA cycle to be metabolized. Il'lhe long-chain fatty acid being metabolized has an odd number of carbon atoms, then the acvl-CoA produced during final cycle through [Gr beta|-lipid oxidation is propionyl CoA. 1'ropionyl CoA is converted to succinyl CoA. The latter is a TCA cycle intermediate and enters the TCA cycle pool. This is an anaplerotic pathway. Fig. 6. Anaplerotic processes supply substrate used to maintain the tricarboxylic acid (TCA) cycle intermediate pool size. In contrast, cataplerotic processes remove substrates from the TCA cycle intermediate pool and decrease its size. The balance between these two processes determines the TCA cycle pool size. (A) Glucose (via its metabolic product pyruvate) contribution to anaplerosis. (B) The P-oxidation of odd-numbered carbon chain fatty acids contribution to anaplerosis. Figure 8, which is a flowchart for P-lipid oxidation, should be reviewed before examining Fig. 6B, which depicts the terminal reaction of P-lipid oxidation. ADP, adenosine diphosphate; ATP, adenosine-triphosphate; CoA, coenzyme A.
form fructose-6-phosphate. A second phosphorylation of fruc-tose-6-phosphate via phosphofructo-kinase generates fructose-1,6-bisphosphate. Each of these phosphorylations consumes one molecule of ATP. NADH which can be utilized by the mitochondria to generate ATP (see Section 3.8.). In the next reaction, the high-energy phosphate bond in 1,3-bisdiphosphoglycerate is transferred to adenosine diphosphate (ADP) to form ATP and 3-phosphoglycerate via the enzyme phosphoglycerate kinase. The latter molecule is converted to 2-phosphoglycerate by the enzyme phosphoglycerate mutase. Enolase, another cytosolic enzyme, then converts 2-phospho-glycerate to the ~P-containing molecule phosphoenolpyruvate, which is converted to pyruvate by the enzyme pyruvate kinase. During this reaction, the ~P in phosphoenolpyruvate is transferred to ADP to form a second ATP molecule. Pyruvate can then enter the mitochondria to be metabolized further by the pyruvate dehydrogenase (PDH) complex of enzymes. Both the PDH complex, which converts pyruvate to acetyl CoA (coen-zyme A) (and NAD+ to NADH), and the tricarboxylic acid (TCA) cycle that metabolizes acetyl CoA are located within the mitochondria (Figs. 5, 6A, and 7). Within the mitochondria, another metabolic pathway for pyruvate exists. The enzyme pyruvate carboxylase converts pyruvate to oxaloacetate, which is a TCA cycle intermediate ( Figs 6A and 9). The significance of the latter reaction is discussed in the legend of Fig. 6. Within the cytosol, pyruvate can be converted to lactic acid by lactic acid dehydrogenase (LDH). Lactate is then exported from the cell via the monocarboxylic acid transporter (Figs. 5 and 13). This reaction results in the oxidation of NADH to NAD+, and as will be shown in Section 4.1.l., this reaction is critical when the availability of oxygen to the cardiomyocyte is limited. 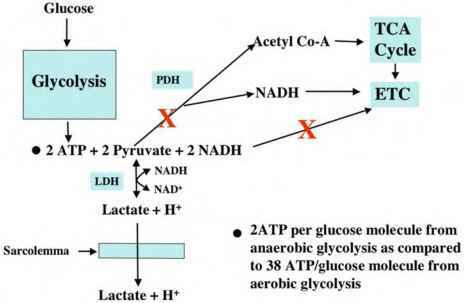 Conversely, under aerobic conditions, lactate can be transported into the cytosol by the monocarboxylic acid transporter to be converted to pyruvate by LDH. The LDH-catalyzed reaction also reduces NAD+ to NADH, and the reducing equivalents from NADH can be transferred into the mitochondrial matrix by the malate-aspartate shuttle. Fig. 7. The major features of mitochondrial morphology. See text for discussion. mation of many more ATP molecules (38) than does glycolysis alone (2). However, when mitochondrial function is severely oxygen limited, the oxidative contribution to ATP synthesis is lost, and there is a net production of two ATP molecules from each glucose molecule passing through the glycolytic pathway. Fig. 8. Flowchart depicting the cellular uptake of free fatty acids and the pathways through which their metabolism proceeds. Blue dots indicate products of P-lipid oxidation. See text for discussion. ATP, adenosine triphosphate; CoA, coenzyme A; CPT, carnitine palmatoyl-transferase; CACT, carnitine-acylcarnitine transporter: ETC, electron transport chain; FADH2, flavin adenine dinucleotide; FFA, free fatty acids; NADH, nicotinamide adenine dinucleotide; TCA, tricarboxylic acid. Fig. 9. The tricarboxylic acid (TCA) cycle is depicted. 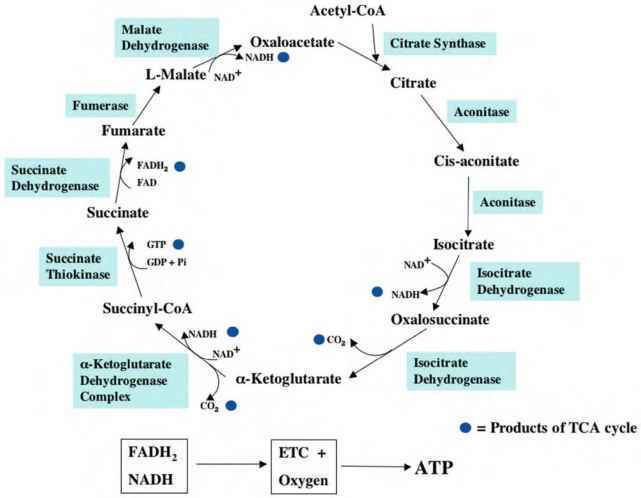 The filled blue circles are the products resulting from one turn of the TCA cycle. See text for discussion. ATP, adenosine triphosphate; CoA, coenzyme A; ETC, electron transport chain; FAD, oxidized flavin adenine dinucleotide; FADH2, reduced flavin adenine dinucleotide; GDP, guanosine 5'-diphosphate; GTP, guanosine 5'-triphosphate; NAD+, oxidized nicotinamide adenine dinucleotide; NADH, reduced nicotinamide adenine dinucleotide; Pi, inorganic phosphate. Mitochondria, which are the primary site of ATP synthesis in most mammalian cells, contain the p-lipid oxidation enzymes, the TCA cycle enzymes, the electron transport chain (ETC), and the F1F0-H+-ATPase (also called F1F0-ATP syn-thase or ATP synthase). To understand better the location of these systems, mitochondrial structure is briefly reviewed (Figs. 7,10, and 11). The inner mitochondrial membrane contains the ETC, F1F0-H+-ATPase, adenine nucleotide trans-locase, and other transporters. The matrix contains the TCA cycle enzymes, p-lipid oxidation enzymes, and other enzymes and reactants. The cristae are invaginations that markedly expand the surface area of the inner membrane and thereby the contents of enzymes associated with the inner membrane. ine kinase, which is important to high-energy phosphate transport out of mitochondria (Fig. 12) and cytochrome-c, a component of the ETC. 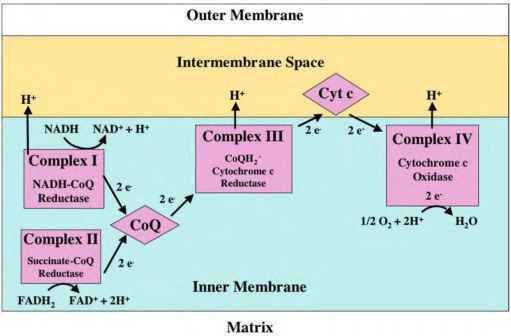 The importance of the intermembrane space to oxidative ATP synthesis is discussed in Sections 3.6. and 3.7. Figure 8 presents a flowchart for the p-lipid oxidation pathway. Dietary long-chain, nonesterified, free fatty acids (NEFAs) are usually the predominant cardiac substrate. They are transported in the blood bound to plasma albumin or in the form of triacylglycerol, which is also bound to albumin. The latter can be broken down to release NEFA by an enzyme present in the plasma and at the surface of the capillary and cardiomyocyte. Fig. 10. The electron transport chain (ETC) is depicted. See text for discussion. FADH2, flavin adenine dinucleotide; NAD, NADH, nicotinamide adenine dinucleotide, FAD, oxidized flavin adenine dinucleotide; CoQ, coenzyme Q; Cyt c, cytochrome c.
ecules are either reesterified and stored as triglycerides or activated by acyl CoA synthetase (in the presence of free CoA and ATP) to form a long-chain acyl CoA. Because long-chain acyl CoA cannot readily diffuse through the mitochondrial inner membrane, the long-chain acyl CoA is converted to long-chain acyl carnitine by carnitine palmatoyl-transferase 1 (CPT1) at the outer surface of the inner mito-chondrial membrane and then transported across the inner membrane by carnitine-acylcarnitine translocase (which also transports free carnitine liberated by carnitine palmatoyl-trans-ferase 2 [CPT2] back into the intermembrane space). The long-chain acylcarnitine is next converted back to acyl CoA at the inner surface of the mitochondrial inner membrane by CPT2. Long-chain acyl CoA is then processed by a sequence of enzyme-catalyzed reactions that comprise the p-lipid oxidation pathway. If the long-chain acyl CoA has an even number of carbon atoms, then the final products of the last cycle of an acyl CoA molecule through the p-oxidation sequence are two acetyl CoA molecules (Fig. 6B). However, if the long-chain acyl CoA has an odd number of carbon atoms, then the products of the last cycle through p-oxidation are one acetyl CoA and one propionyl CoA. Unlike acetyl CoA, propionyl CoA cannot enter the TCA cycle. Propionyl CoA can be converted to succinyl CoA, which is a TCA cycle intermediate (Fig. 6B). Hence, this pathway contributes to the maintenance of the TCA cycle intermediate pool size; both pyruvate molecules produced from glucose and odd-numbered fatty acid molecules that undergo complete p-oxida-tion contribute to maintenance of the TCA intermediate pool. Processes that add molecules to the TCA intermediate pool are termed anaplerotic (Fig. 6A,B), and those that remove interme diates from the pool are called cataplerotic. The importance of these processes to TCA cycle function is illustrated in a clinical example presented in Section 4.3. The products of complete p-oxidation of a fatty acid are acetyl CoA (and propionyl CoA if the acyl chain has an odd number of carbons), NADH, and reduced flavin adenine dinucleotide (FADH2). Yet, consumption of acetyl CoA by the TCA cycle and NADH and FADH2 by the ETC cannot occur in the absence of oxygen. Thus, p-oxidation also cannot occur under anoxic or ischemic conditions. Therefore, markedly ischemic myocardium does not support fatty acid-derived ATP synthesis, and the only remaining source of ATP synthesis is anaerobic glycolysis. The carbon substrate consumed by the TCA cycle is acetyl CoA. Acetyl CoA is produced by glycolysis and p-lipid oxidation as described in Sections 3.2. and 3.4., respectively. Figure 9 shows the individual reactions of the TCA cycle. In the first step of the cycle, acetyl CoA contributes two carbon atoms to oxaloacetate to form citrate and free CoA. This reaction is catalyzed by the enzyme citrate synthase. Citrate then enters a sequence of reactions that ultimately generate two molecules of CO2 and four reducing equivalents in the form of NADH (3) and FADH2 (1). One high-energy phosphate molecule (guanosine 5'-triphosphate) is also produced, which can be converted to ATP. During this process, citrate (a six-carbon molecule) is stepwise decarboxylated and ultimately converted back to oxaloacetate, a four-carbon molecule that, when condensed with a new acetyl CoA, reinitiates the sequence of reactions. Fig. 11. The mechanism of oxidative phosphorylation and the transport of adenosine triphosphate (ATP) from the mitochondrial matrix to the intermembrane space are depicted. See text for discussion. ADP, adenosine diphosphate; Pi, inorganic phosphate; ANT, adenine nucleotide transporter; ETC, electron transport chain. The reducing equivalents generated, NADH and FADH2, deliver electrons to the ETC. Rate-limiting enzymes of the TCA cycle are the PDH complex (which precedes, but is not really a component of the TCA cycle), isocitrate dehydrogenase, and a-ketoglutarate dehdrogenase; these enzymes are highly regulated, as discussed in Section 3.7. Interestingly, for elucidating the TCA cycle (also known as the Krebs cycle), Sir Hans Krebs was awarded the Nobel Prize in Medicine or Physiology in 1953. The substrates of the ETC are NADH and FADH2. The ETC (Fig. 10) is composed of two freely diffusible compounds (ubiquinone, also known as coenzyme Q, which is confined to the mitochondrial inner membrane, and cytochrome-c, which is located in the intermembrane space) and four functional complexes (I, II, III, and IV), which are contained within the mito-chondrial inner membrane. The complexes are composed of catalytic and non-catalytic proteins (and their cofactors). NADH interacts with the ETC by transferring electrons to (and thereby reducing) complex I, which in turn then reduces ubiquinone. FADH2 interacts with the ETC by transferring electrons to complex II, which, like complex I, also transfers its electrons to ubiquinone. Reduced coenzyme Q then diffuses to complex III and transfers its electrons. Next, complex III reduces cytochrome-c, which diffuses to complex IV and transfers electrons to this complex. The latter, when fully reduced by four electrons, reduces O2 to two O2 ions. Each O2 combines with two H+ to form H2O in an irreversible reaction. During the process of electron transport, electrons release energy as they pass through the sequence of complexes. The purpose of the ETC is to capture this free energy and use it to pump H+ from the mitochondrial matrix across the inner membrane into the intermembrane space. In this regard, complexes I, III, and IV function as proton pumps (Figs. 10 and 11). These pumps create an electrochemical gradient (A^H+) composed of an electrical potential and a chemical potential (the latter reflected by ApH) across the inner mitochondrial membrane. 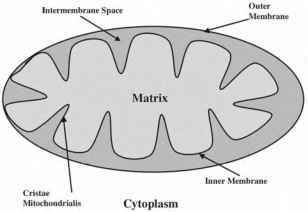 As a consequence of proton transport, the mitochondrial matrix is more negative than the intermembrane space. The F1F0-ATPase, which is also located in the inner mitochondrial membrane (Fig. 11), is the major pathway of H+ return from the intermembrane space into the matrix. The energy released by the passage of H+ down this electrochemical potential gradient is captured by the F1F0-ATPase and used to drive the reaction Pi + ADP — ATP (Pi is inorganic phosphate). In this way, much of the energy released by the metabolism of glucose and fatty acids is transferred to the terminal high-energy phosphate bond of ATP. The concept of proton pumping into the intermembrane space, and the use of the electrochemical gradient thus formed to synthesize ATP, is known as the chemiosmotic theory. In recognition of this (initially quite controversial) insight, Sir Peter Mitchell was awarded the Nobel Prize in Chemistry in 1978. The production of ATP by mitochondria is termed oxidative phosphorylation; in virtually every human tissue (heart, brain, kidney, etc. ), oxidative phosphorylation is the primary source of ATP generation. To date, the precise mechanisms by which the F1F0-H+-ATPase generates ATP from its substrates ADP and Pi remain under investigation. However, a number of characteristics of the process are well established. The F1F0-H+-ATPase has been shown to be a near-equilibrium enzyme. In other words, the reaction can occur in both directions. However, both in isolated mitochondria that are generating ATP under conditions of excess carbon substrate, ADP, and oxygen and also in perfused and in vivo hearts, the F1F0-H+-ATPase operates far out of equilibrium, so virtually all fluxes are in the ADP + Pi -ATP direction. In the presence of abundant oxygen, the F1F0-H+-ATPase is kinetically controlled by the concentrations of its immediate substrates ADP and Pi, which are not usually limiting, and the magnitude of the proton electrochemical potential gradient across the mitochondrial inner membrane. Hence, ADP levels alone can regulate the rate of ATP synthesis so long as Pi, oxygen and carbon substrates are not limiting and the resulting proton gradient is very large. However, in vivo regulatory mechanisms are far more complicated than those described by this simple scheme. As pointed out, a simple kinetic regulatory scheme for oxi-dative phosphorylation with ADP and Pi availabilities controlling the ATP synthetic rate is valid when both oxygen and reducing equivalents are in excess. Under these conditions, the high proton electrochemical gradient will drive ATP synthesis until ADP falls to levels that are rate limiting. From this point, the rate of ADP production determines the steady-state rate of ATP synthesis. Because ADP is a product of ATP hydrolysis, the steady-state rate of ATP synthesis is determined by the steady-state rate of ATP hydrolysis (i.e., the rate of ATP utilization) and the steady-state ADP level required to support that rate of ATP synthesis. This simple feedback regulation of ATP synthesis can be demonstrated in the perfused rat heart if the perfusate contains unphysiologically high concentrations of carbon substrates such as pyruvate or octanoate. Under these experimental conditions, myocardial ADP concentrations become low enough to regulate oxygen consumption kinetically; an increase in the rate of ATP utilization will cause ADP levels to rise, which in turn stimulates an increase in the rate of oxygen consumption. In this construct, the increased rate of delivery of ADP to the F1F0-ATPase increases the rate of ATP synthesis as long as ADP levels rise to values capable of supporting the new higher rate of ATP synthesis. In other words, ADP levels must increase concordant with the rate of ATP synthesis. This type of regulation is well described by the single-substrate Michalis-Menten model. However, in large animal hearts (e.g., dog, swine, and human) in vivo ADP levels are higher than in the isolated perfused rat heart and are well above the usual kinetic regulatory range described in studies of isolated mitochondria or perfused rat hearts. Further, as MVO2 increases, ADP levels actually remain fairly constant in the in vivo large animal heart. This does not mean that ADP availability is not crucial to the rate of ATP synthesis. When the rate of ATP expenditure is increased, there must always be an identical increase in the rate of ADP delivery to mitochondria (once a new steady state is reached). This increase in the rate of ADP delivery to the ATP synthase is obligatory, but a change in steady-state ADP levels is not. The observation that ADP levels did not increase in the in vivo myocardium as the rate of ATP synthesis increased led to the recognition that additional regulatory systems were required to explain the data in in vivo models. Further, the overall regulatory processes must have very rapid response times regarding facilitation of ATP synthesis. The last is required because myocardial contents of ATP and creatine phosphate (PCr; another high-energy phosphate bond storage molecule that serves to buffer ATP levels) are only sufficient to support a few seconds of ATP expenditure in the absence of ATP synthesis. The reaction converting cytosolic ATP to PCr is rapid and near equilibrium via the enzyme creatine kinase. Figure 12 provides a brief overview of the ~P and ADP transport function of PCr. Fig. 12. The creatine kinase shuttle (CKS) hypothesis is depicted. The diffusion rate of adenosine diphosphate (ADP) across the outer mitochondrial membrane and through the cytosol is relatively slow. The CKS (and other shuttle systems not described; see source at end of this chapter) is thought to facilitate the transfer of ADP from sites of adenosine triphosphate (ATP) utilizing reactions to the mitochondrial intermembrane space and to facilitate the transfer of ATP to the sites of utilization. The way the shuttle is proposed to function is as follows: The adenine nucleotide transporter (ANT), which is not rate limiting, transports ADP from the mitochondrial intermembrane space to the mitochondrial matrix, where it is rephosphorylated back to ATP. The ANT simultaneously transports newly synthesized ATP from the matrix to the intermembrane space. Within the intermembrane space, the mitochondrial isozyme of creatine kinase (MCK) transfers the terminal high-energy phosphate of ATP to creatine (Cr) to form phos-phocreatine (PCr). PCr then diffuses into the cytosol, and the ADP produced by this reaction in the intermembrane space is returned to the mitochondrial matrix by ANT, where it is rephosphorylated. The PCr that has diffused into the cytosol is then used as a high-energy phosphate donor for the rephosphorylation of cytosolic ADP by the cyto-solic isozyme of creatine kinase (CCK). 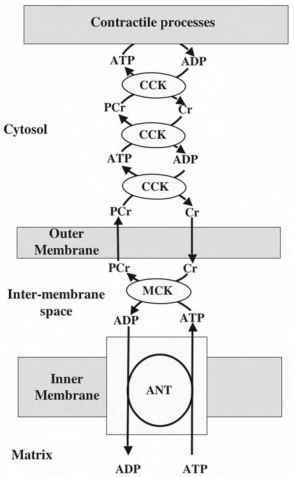 Because CCK has an extremely rapid turnover rate, it can facilitate transport of ATP from the mitochondria to the site of its hydrolysis and of ADP from the hydrolysis site back to the mitochondrial outer membrane. There, PCr leaving the mitochondria is used to rephosphorylate ADP, and the Cr liberated from PCr diffuses into the mitochondrial inner membrane space to be rephosphorylated. As a result, cytosolic ADP levels (including those in proximity to the points of ATP utilization) are kept at low levels even if the rate of ATP utilization increases. The stability of ADP levels in the face of increasing ATP utilization permits ATP to maintain a high level of free energy that can be transferred to energy requiring cellular processes. A discussion of additional regulatory mechanisms for oxidative phosphorylation is presented next, and a review of the discussion of cardiomyocyte contraction mechanisms presented in Chapter 8 will refresh understanding of cardiomyocyte Ca2+ dynamics relevant to the following discussion. During exercise, increased norepinephrine release by the sympathetic nervous system activates p-adrenergic receptors in cardiomyocytes. Their activation causes an increase of heart rate (by acting on the sinoatrial node) and an increase of Ca2+ entry into the cytosol of the cardiomyocytes via the sarcolem-mal voltage-dependent Ca2+ channel. The increased Ca2+ entering the cytosol, together with p-adrenergic receptor-stimulated activation of sarcoplasmic reticulum Ca2+ pumping, increases sarcoplasmic reticulum Ca2+ stores. The more fully loaded sar-coplasmic reticulum can then release more Ca2+per beat into the cytosol, resulting in a larger systolic cytosolic Ca2+ transient. Both the increased frequency (heart rate) and the larger Ca2+ transient size serve to increase the "average" Ca2+ level in the cytosol. Mitochondria normally transport Ca2+ in and out of the matrix and maintain a "steady-state" matrix Ca2+ level that is related to average cytosolic Ca2+. In response to higher average cytosolic Ca2+ levels, mitochondrial Ca2+ uptake increases, resulting in an increase in the steady-state level of matrix Ca2+. Increased mitochondrial matrix Ca2+ has at least two important effects on oxidative phosphorylation. First, as mentioned, the TCA cycle has three rate-limiting enzymes (PDH, isocitrate dehydrogenase, and a-ketoglutarate dehydrogenase), and the activities of these enzymes are partly regulated by mitochon-drial matrix Ca2+ levels. When these enzymes interact with Ca2+, their sensitivities to their respective substrates are increased. This accelerates their reaction rates and increases the rates of acetyl CoA entry into and flux through the TCA cycle without requiring pyruvate, acetyl CoA levels, or TCA cycle pool intermediate levels to rise, provided the rate of delivery of acetyl CoA to the TCA cycle is increased sufficiently to support the increased TCA cycle flux rate. Therefore, glucose uptake and glycolysis-mediated delivery of pyruvate to, and its rate of metabolism by, PDH must increase or the rates of fatty acid uptake by the cell and p-oxidative delivery of acetyl CoA to the TCA cycle must increase to support the increased rate of TCA cycle flux. In practice, the rates of cellular substrate uptake, glycolytic flux, and p-oxidation all respond to metabolic signaling, and the required increases in the rates of acetyl CoA production occur. A major consequence of an increased TCA cycle flux is more rapid generation of mitochondrial NADH and FADH2, which are the major substrates for the ETC. The subsequent stimulation of ETC flux results from an increased rate of NADH generation and a primary stimulation of ETC complex activities by other metabolic signals present during periods of increased ATP demand. Increased rates of ETC flux result in increased rates of H+ pumping by the ETC, which serve to maintain the electrochemical gradient across the inner mito-chondrial membrane at a level adequate to support the increased rate of ATP synthesis. In addition, the FjF0-ATPase is regulated such that the fraction of this enzyme that is in the active state is increased by elevation of mitochondrial matrix Ca2+. An increased fraction of the enzyme in the active state is beneficial during periods of increased ATP synthesis because an increased amount of active enzyme increases the rate of ATP synthesis without requiring ADP levels to rise as long as the rate of ADP delivery to mitochondria increases appropriately (which it will when the rate of ATP utilization increases). These observations support the concept that increased average cardiomyocyte cytosolic Ca2+ levels (e.g., that occur during exercise) act as a feed-forward signal for oxidative phosphorylation. This signal stimulates, in a parallel manner, ATP utilization by the contractile processes and ATP synthesis by the FjF0-ATPase. The net effect of these regulatory mechanisms (and additional feedback regulatory mechanisms not discussed) is to facilitate flux of basic food-derived carbon substrates through the metabolic sequences without requiring the cytosolic concentrations of the initial and intermediate substrates (including ADP) to increase. The rapid response time of the entire system also allows ATP levels to remain relatively constant despite wide and rapid fluctuations in the rate of ATP utilization. Because these mechanisms allow both ADP and ATP levels and the ATP/ ADP ratio to remain stable at increased ATP synthetic rates, the free energy that can be released by ATP hydrolysis and transferred to other reactions is maintained constant despite the increased rate of ATP expenditure. 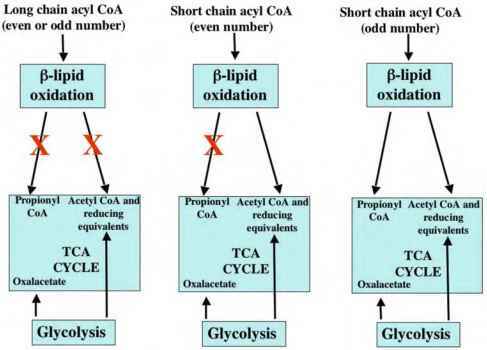 Control theory as applied to the regulation of oxidative phosphorylation, glycolysis, and p-lipid oxidation, and the TCA cycle has been the subject of detailed study. 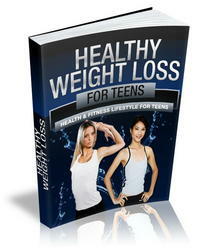 A more detailed discussion of this topic is presented in the sources listed at the end of this chapter. The most common cause of inadequate myocardial ATP synthesis is ischemia, and the most frequent cause of myocar-dial ischemia is occlusive coronary artery disease. If narrowed coronary arteries can conduct adequate blood flow to sustain aerobic metabolism in the dependent myocardium during basal levels of activity but do not allow sufficient increases in flow to meet increased demands for ATP production during states of increased cardiac work (as would be caused by exercise), then it is classified as demand ischemia. This state can often be observed in patients with stable, inducible angina pectoris; the patient is asymptomatic at rest or during mild exertion, but when the work of the heart exceeds the ability of a narrowed coronary artery to meet the increased blood flow demand, then ischemia ensues, and the patient experiences chest pain. 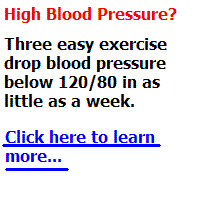 In response to the symptom of chest pain, the patient will commonly discontinue exercise. During the ensuing rest period, the cardiac work falls into the range at which the narrowed coronary artery can meet the blood flow demand, and the ischemia is relieved. Fig. 13. A flowchart for anaerobic glucose metabolism is depicted. A large red X indicates metabolic pathways blocked during ischemia. See text for discussion. ATP, adenosine-triphosphate; CoA, coenzyme A; ETC, electron transport chain; LDH, lactic acid dehydrogenase; NAD, oxidized nicotinamide adenine dinucleotide ; NADH, reduced nicotinamide adenine dinucleotide; PDH, pyruvate dehydrogenase; TCA, tricarboxylic acid. monly, supply ischemia can occur as the result of coronary spasm, in which inappropriate (pathological) vasoconstriction of an epicardial coronary artery causes transient total or near total reduction of flow. Although the nature of the myocardial ischemic process is qualitatively similar in supply and demand ischemias, supply ischemia is generally considered more clinically threatening. Because of the greater vulnerability of the inner myocardial layers of the left ventricle to blood flow reduction, mild ischemia is usually confined to the subendocardium; as the coronary obstruction becomes more severe, ischemia proceeds as a wavefront from subendocardium to subepicardium until the full wall is involved. When myocardial blood flow is limited, both oxygen and carbon substrate availabilities in turn can limit the ATP synthetic rate, but it is usually the oxygen deficit that is most critical. This is because the myocyte has substantial carbon substrate reserves (i.e., glycogen and triglyceride stores), but is unable to store a significant quantity of oxygen. Consequently, when coronary blood flow is insufficient to meet myocardial needs, the severity of the oxygen deficit determines the extent of limitation of oxidative phosphorylation. Nevertheless, the effect of oxygen limitation is confined to oxidative phosphorylation because glycolytic ATP synthesis does not require oxygen (Figs. 5 and 13). During hypoxia (in which blood oxygen content is markedly reduced, but blood flow is not limited) or in ischemic conditions (in which blood flow is restricted, but blood oxygen content is normal), electron transport by the ETC slows or stops depending on the severity of the oxygen deficit because electrons cannot be transferred from cytochrome oxidase to molecular oxygen (the terminal electron acceptor). As a consequence, the pumping of H+ from the mitochondrial matrix into the intermembrane space stops because it depends on energy liberated as electrons pass through the ETC. As a result, the protonmotive force across the inner mitochondrial membrane begins to dissipate, and mitochondrial ATP synthesis fails. If the dissipation of the H+ gradient is marked, then the FjF0-H+-ATPase operates in the reverse direction; that is, it converts ATP to ADP and uses energy liberated by ATP hydrolysis to pump H+ back into the intermembrane space. Hence, mitochondria can either synthesize ATP under physiological conditions or degrade ATP when oxygen is severely limited. Because the H+ electrochemical potential is used to energize other mito-chondrial transport functions in addition to supporting ATP synthesis, mitochondrial degradation of ATP during periods of oxygen limitation may serve to preserve nonoxidative mito-chondrial function for a time at the expense of hastening the fall in cytoplasmic ATP levels. Glycolysis, which in principle can proceed normally in the absence of oxygen, is also limited when blood flow is reduced during ischemia. Oxygen limitation causes cessation of ETC function and thereby stops the mitochondrial consumption of reducing equivalents transferred from cytosolic NADH. This occurs because mitochondrial NADH oxidation also stops, mitochondrial NAD+ levels fall, and there is no recipient for reducing equivalents transported from the cytosolic NADH pool. Cytosolic NAD+ is a substrate of glyceraldehyde phosphate dehydrogenase (GAPDH), and if the NADH generated by that reaction is not oxidized back to NAD+ by the transfer of reducing equivalents into the mitochondria by the malate-aspartate shuttle or the conversion of glycolytically produced pyruvate into lactate by LDH and the subsequent efflux of lactate and accompanying H+ions from the myocyte, then the lack of NAD+ inhibits GAPDH. Therefore, factors that limit the rates of glycolytic ATP synthesis during ischemia are accumulations of cytosolic NADH, lactate and H+ ions. Under conditions of unrestricted coronary flow, the myocardium can rapidly export both of these ions even when the glycolytic rate is markedly increased; that is, a low oxygen content of coronary arterial blood which limits oxygen delivery to the myocyte does not per se limit lactate and H+ export. In contrast, when the myocardium is ischemic, the capacity to export lactate and protons decreases in proportion to the severity of the blood flow reduction. Because the conversion of pyruvate to lactate results in the oxidation of cytosolic NADH, the availability of NAD+ to GAPDH is further reduced when rising levels of lactate slow this reaction and glycolysis ultimately stops for this reason or because glycogen stores are exhausted (Figs. 5 and 9). In contrast, during hypoxia, coronary flow is not restricted, and glycolysis proceeds at a rapid rate because metabolic signaling activates both the rate-limiting glycolytic reactions and the transport of glucose into the myo-cyte. During moderate ischemia, when both glucose and oxygen delivery are impaired, myocyte glycogen stores are the main source of glucose for glycolysis. When glycogen stores are exhausted, the rates of glucose delivery to, and lactate clearance from, the ischemic myocyte (which are limited) control the rate of glycolysis. These concepts have specific importance in patients with coronary artery disease because they define the boundaries for viability of the ischemic myocardium. In the moderately ischemic myocardium, contractile function rapidly decreases in response to: (1) decreased ATP availability, (2) accumulation of H+ ions, and (3) other less-well-defined factors. However, if residual coronary blood flow during ischemia is sufficient to permit some glycolysis (by allowing the export of some lactate and H+ and the import of glucose), then modest ATP production and, consequently, viability may be preserved for some time. In contrast, during acute total coronary occlusion, glycolysis is rapidly inhibited, and myocardial death will occur. Hence, a level of coronary blood flow that is insufficient to maintain oxidative phosphorylation and contractile function may support sufficient glycolytic ATP production to sustain myocardial viability until appropriate medical or surgical treatment can restore blood flow to the ischemic myocardium. During fetal life, the myocardium primarily metabolizes glucose rather than fatty acids. This pattern of metabolism is well suited to the lower oxygen levels found in fetal arterial blood; glucose metabolism requires less oxygen than fatty acid metabolism. In addition, the lower cardiac work levels (lower blood pressure) occurring in the fetus are adequately supported by ATP production through glycolysis and pyruvate oxidation. After birth, substrate preference of the heart (now in a higher oxygen environment and operating at a higher workload) rapidly shifts to the adult pattern of predominant fatty acid oxida tion. This change of substrate preference is the result of upreg-ulated expression of genes controlling the transport of fatty acids into the myocyte and their subsequent metabolism in the cytosol and mitochondria. 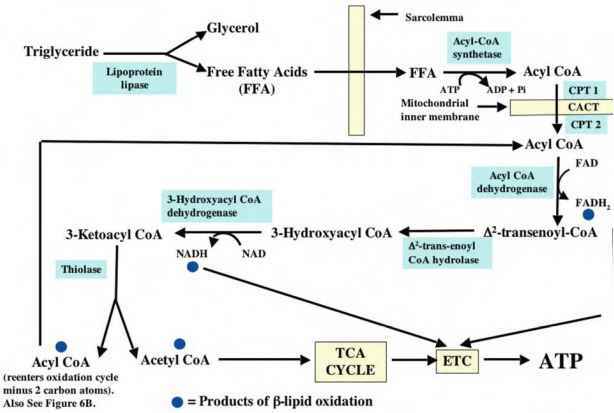 This upregulation in the expression of genes involved in fatty acid metabolism, and oxidative phos-phorylation is commonly referred to as the shift from a fetal to an adult gene expression pattern. A chronic mechanical overload produced by hypertension, heart valve abnormalities, or destruction of a portion of the left ventricle by infarct initially results in some degree of left ventricular dilation. Left ventricular wall tension increases as a consequence of the La Place relationship between wall tension and chamber radius. The increased wall tension activates changes in the expression patterns of a number of genes involved in both myocyte growth (hypertrophy) and metabolism. The resultant increase of left ventricular wall thickness returns systolic wall stresses more toward normal, often resulting in a prolonged period of compensated myocardial hypertrophy. However, myocardial hypertrophy is associated with important changes in energy metabolism. These include reductions of high-energy phosphate compounds (HEP; i.e., ATP and CP) levels and alterations in carbon substrate preference with decreased utilization of free fatty acids and increased dependence on glucose. This shift in the myocardial gene expression to increased glucose and decreased fatty acid utilization is referred to as a reversion to the fetal gene expression pattern. Subsequently, reductions in the levels of enzymes and transporters crucial to oxidative phosphorylation also occur. Although the increased glucose metabolism and decreased fatty acid metabolism associated with this reversion (to a fetal gene expression pattern) may have energetic benefits, the overall ATP synthetic capacity of severely hypertrophied and failing myocardium is significantly reduced. Whatever the cause, the period of compensated hypertrophy in an overloaded heart is often followed by contractile dysfunctions of the myocytes with ultimate progressive left ventricular dysfunction, then to be diagnosed as the clinical syndrome of heart failure. It has been unclear whether decreased ATP synthetic capacity in hypertrophied or failing cardiomyocytes actually constrains contractile performance and contributes to the progression to a decompensated state. The issue has been whether contractile dysfunction in the failing heart is caused primarily by a limited ability of the contractile apparatus to consume ATP or whether the reduced ability to produce ATP is also contributory. Experimental data have shown that the upregulation of glucose metabolism that occurs in hypertrophied or failing myocardium may not adequately compensate (from the standpoint of ATP synthetic capacity) for the downregulation of fatty acid metabolism that occurs in these hearts. Fig. 14. The effects of very long-chain acyl-dehydrogenase deficiency on the metabolism of long-chain fatty acids (even and odd numbered), short-chain fatty acids (even numbered), and short-chain fatty acids (odd numbered). Only the last can also supply anaplerotic substrate to the tricarboxylic acid (TCA) cycle. A large red X indicates metabolic pathways that cannot be used by a specific type of free fatty acid. See discussion in text. CoA, coenzyme A.
the fetal shift in gene expression (substrate preference) that normally occurs in this condition is insufficient to compensate for the bioenergetic abnormalities present in the hypertrophy-ing myocardium. The discussion of cardiac dysfunction considers the possibility that acquired defects in the overloaded cardiomyocyte may limit ATP synthesis sufficiently to constrain mechanical function. Yet, abnormalities of left ventricular function can add an ischemic component to the metabolic abnormalities of hypertrophied and failing myocardium even in the absence of occlusive coronary artery disease. As discussed, increased ventricular filling pressures and tachycardia in the abnormal heart can limit the ability of myocardial blood flow (especially in the subendocardium) to increase normally in response to an increased metabolic rate. Hence, in the chronically overloaded heart, acquired intrinsic abnormalities of the cardiomyocytes and superimposed limitations of blood flow can act together to compromise cardiomyocyte ATP synthetic capacity and thus further impair cardiac function. As described previously, changes in gene expression associated with cardiac hypertrophy or heart failure can cause various abnormalities of myocardial metabolism that in turn may act to constrain contractile function. However, "primary" (genetically determined) abnormalities of carbon substrate metabolism or oxidative phosphorylation can also cause myocyte hypertrophy and failure. Refer to the sources at the end of this chapter for more information on such defects. A dramatic example of this type of genetically induced metabolic abnormality and a successful therapeutic approach based on sound biochemical principles have been described and are discussed next. An inherited deficiency of the enzyme very long-chain acyl-CoA dehydrogenase (VLCAD) is known to be associated with cardiomyopathy and skeletal muscle myopathy (Fig. 14). Because most dietary fatty acids are of the long-chain type, the deficiency of VLCAD results in a markedly increased cardiac dependence on glucose for ATP generation. The fact that even upregulated glucose metabolism cannot adequately support cardiac function is indicated by the development of progressive myopathy (although the cytosolic accumulation of long-chain fatty acids also contributes to the myopathy). 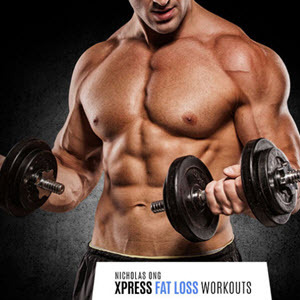 The classical treatment has been to replace the long-chain fatty acids in such an individual's diet with even-numbered short- or medium-chain length fatty acids such as octanoate or decanoate. The short-chain fatty acids bypass the metabolic roadblock, because the medium- and short-chain acyl-CoA dehydrogenases are normal in these patients. This strategy induces increased fatty acid utilization and causes clinical improvement; unfortunately, in many such patients, cardiac and skeletal muscle myopathies persist. Why does feeding even-numbered short-chain length fatty acids not fully correct the muscle defects in these patients despite the augmentation of acetyl CoA delivery to the TCA cycle? It should be recalled that VLCAD deficiency causes limitation of both acetyl CoA and propionyl CoA delivery to the TCA cycle. Thus, although even-numbered short-chain fatty acids supply acetyl CoA, they do not supply the ana-plerotic substrate propionyl CoA and consequently cannot correct the lack of an anaplerotic contribution from p-lipid oxidation. Hence, an increase in consumption of even-numbered short-chain fatty acids would not be able to correct the decrease in TCA intermediate pool size resulting from a propionyl CoA deficiency (Fig. 6B). Following this logic, dietary supplementation with an odd-numbered short-chain fatty acid would permit p-lipid oxidation to supply both acetyl CoA and propionyl CoA (the latter would increase TCA intermediate pool size). 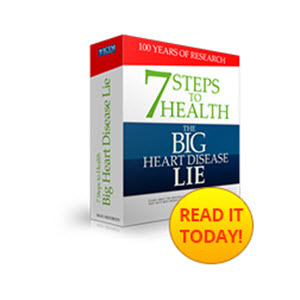 In fact, when patients were treated with the short-chain seven-carbon fatty acid heptanoate, they showed marked improvement in both skeletal muscle and cardiac abnormalities. Hence, this disorder was effectively managed by understanding the basic biochemical defect and prescribing a treatment strategy that compensated for this defect.